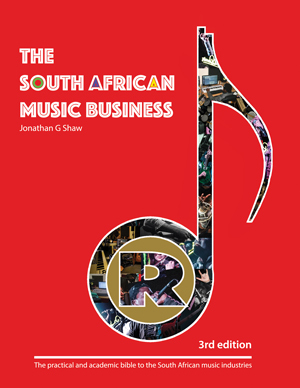 Jonathan G Shaw's textbook The South African Music Business: A Practical and Academic Bible to the South African Music Industries, was first published in 2007, the second edition in 2010 and the third on the 5th of July 2017. The South African Music Business was the first major textbook on the South African music industries and has become a neccessary companion for everyone in the music biz. It explains the structure, law, finance, management and marketing of the the recorded music sector, live music sector and music publishing sector. It is being used by leading universities such as WITS, UNISA, DUT, UCT and numerous music and sound engineering colleges around the country. Read the articles in MIO, Business Day and the Citizen newspaper as well as the Citizen's review of the book. Josh Prinsloo wrote a blog review of the book. Buy the book at a retailer that is nearest or most familiar to you now! Order the book direct by emailing Intersoft or by fax on 011 341 0834. 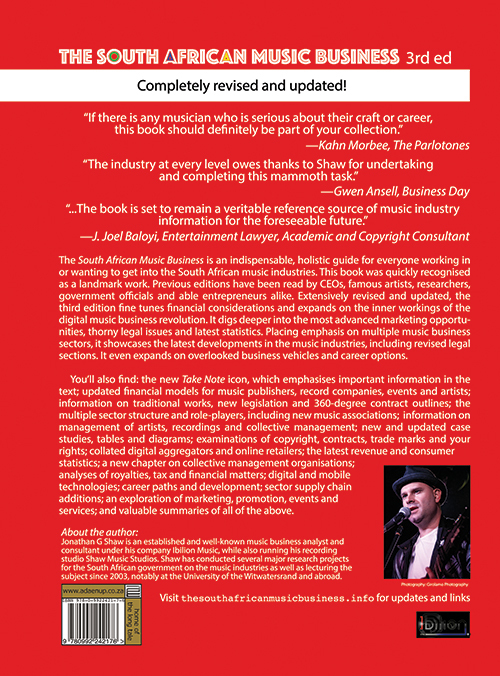 Read more about "The South African Music Business, 3rd Edition" at ada enup cc. © 2017-2019 Ibilion Music. All Rights Reserved.